The children, ages three to 17, are students at the School of Dance and Musicianship in Midland. 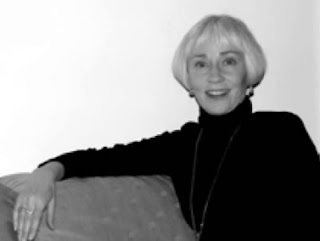 Patricia Stenton, director of the school, also has the role of producer and choreographer. 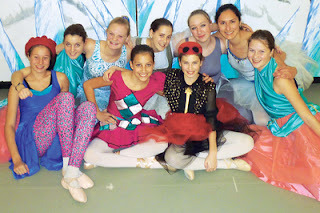 “I started thinking about ‘The Snow Queen’ as a ballet in the spring of 2009. When I discussed it with my senior dancers and saw their enthusiasm, my work (began) in earnest,” she said. She read the Hans Christian Anderson fairy tale over and over, selecting the essential elements in order to arrange them into dance scenes. “The Snow Queen” is a story about two friends, Gerda and Kai, who are separated when the Snow Queen takes Kai to her icy domain. A magic mirror adds to the dramatic events, and Gerda must brave many adventures when she sets out in search of her friend. The ballet is filled with many colourful characters Gerda meets along the way to the story’s happy ending. All proceeds of the production will go to Sleeping Children Around the World, which has been the charity of choice for all of school’s public performances since 1991. The Canadian organization provides bed kits containing a mattress, bedding, clothing and sometimes school supplies, dishes or a layette for a baby. 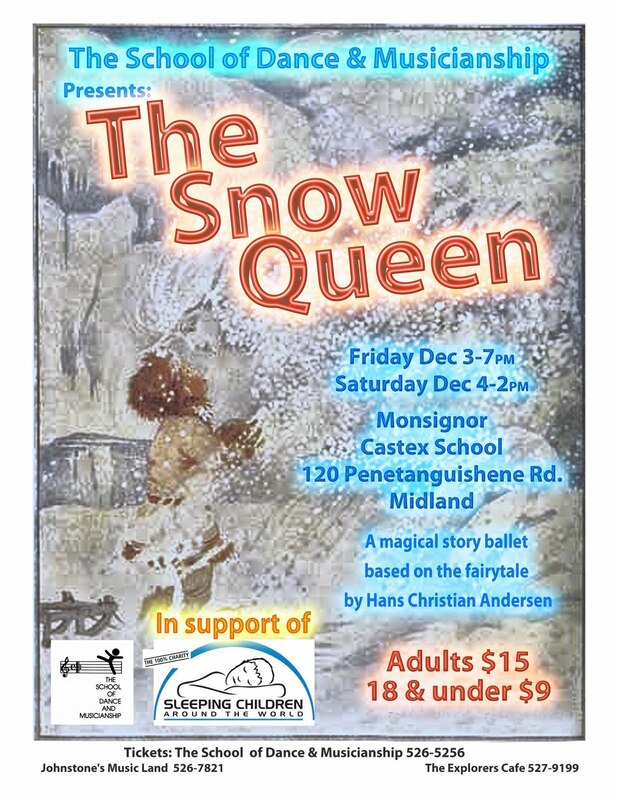 “The Snow Queen” will take to the stage at Monsignor Castex School on Dec. 3 at 7 p.m. and Dec. 4 at 2 p.m.
Tickets are $15 for adults and $9 for those 18 and under. They are available at Johnstone’s MusicLand, The Explorers Café, Karma Marketplace and through the School of Dance and Musicianship at 526-5256. For more information about Sleeping Children Around the World, or to make a donation, visit www.scaw.org. MISSISSAUGA, ON – The Mississauga St. Michael’s Majors are pleased to announce the details for the teams fourth annual Teddy Bear Toss. Children locally and abroad will once again benefit from this years event as the Boys and Girls Club of Peel Region will be receiving the bears that are tossed on the ice and Sleeping Children Around the World will receive funds through stuffed animals that are sold at the game. Fans are encouraged to bring a new or lightly used stuffed animals to the game to toss onto the ice after the Majors first goal of the game. The team is also encouraging fans to purchase a stuffed animal when they arrive to further support the cause. Canadian Tire stores in Mississauga are donating 2000 stuffed animals to the event. The Majors have hosted a Teddy Bear Toss every year since the team arrived in Mississauga for the 2007-2008 season. Their first toss was on December 14th, 2007, when then rookie Casey Cizikas scored at the 16:43 mark of the first period, giving the Majors a 1-0 lead, and giving the fans reason to let their teddy bears fly. A total of 746 bears were collected in the inaugural toss. In 2008, the game was played on December 12th, against the Majors old rivals, the Niagara IceDogs. This time, Captain Jesse Messier got the Majors first goal and sent 963 stuffed animals flying on the ice. Last season, the Majors took on the Ottawa 67’s and set a new record for Mississauga Teddy Bear Tosses once again. This time is was Kelly Geoffrey who opened the scoring for Mississauga and 1013 stuffed animals flooded the ice. The ceremonial puck drop on December 10 will include representatives from the Boys and Girls Club of Peel Region, Canadian Tire and Sleeping Children Around the World. Sleeping Children Around the World will be represented by Dave Dryden who played for the Majors the last time the team won the Memorial Cup in 1961. After winning the Memorial Cup with St. Mike’s, he went on to a solid 14 year career in the NHL and WHA. He now devotes his time and energy to Sleeping Children Around the World. Fans also have the opportunity to get discounted tickets to the game. Beginning on Saturday, December 4, Canadian Tire stores in Mississauga will be handing out a coupon for $4 off a ticket to the December 10 game with purchase. Vouchers are limited so make sure to stop in at your closest Canadian Tire store. All five Canadian Tire stores in Mississauga will be participating (Canadian Tire Meadowvale - 6670 Meadowvale Town Centre Circle, Canadian Tire Heartland – 5970 Mavis Road, Canadian Tire Southdown – 900 Southdown Road, Canadian Tire Dixie/Dundas – 1156 Dundas St. E and Canadian Tire Mavis/Dundas – 3050 Mavis Road). The Majors, Sleeping Children Around the World and the Boys and Girls Club of Peel Region thankful to have the support of the five Dealers of the Mississauga Canadian Tire stores. The Canadian Tire stores in Mississauga help children participate in sports through their JumpStart program and are giving back to the community with their continued support of the Toys for Tots initiative again this year. This opportunity allows them to continue on with their community support of the Boys and Girls Clubat this important time. Being able to assist the Dryden family with their worthy charity is an added bonus of this fun event. Tickets to the game are available at the Hershey Centre box office or online at ticketmaster.ca. Fans can also purchase tickets by calling 905-502-7788 x. 1. New MasterCard Memorial Cup Six Game Flex Packs are now available as well. Fans can get tickets to the entire MasterCard Memorial Cup and six flex pack vouchers as well for as little as $549 (plus applicable taxes and fees). Call 905-502-7788 x. 1 or visit stmichaelsmajors.com for more information. 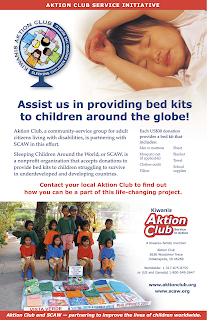 The mission of SCAW is to provide bed kits to children in need throughout the developing world. This is carried out through free-will donations and partnerships with volunteers around the globe. A bed kit donation of $37 provides a mat or mattress, pillow, sheet, blanket, mosquito net (if applicable), clothes outfit, towel and school supplies. 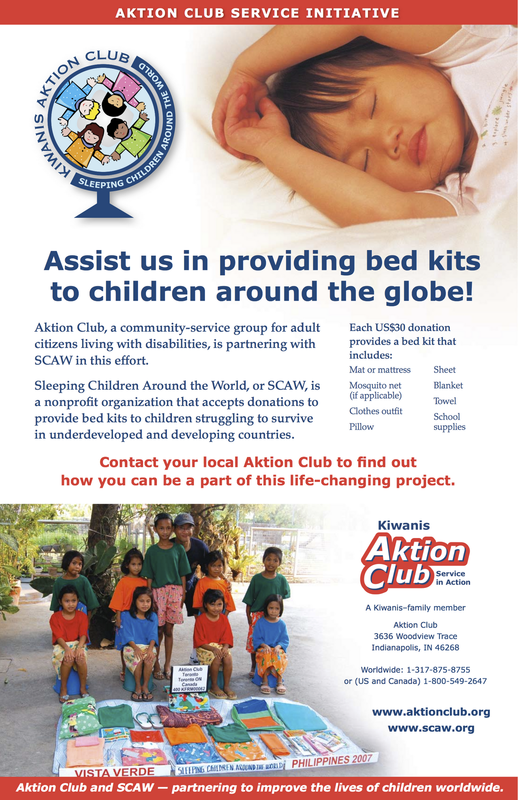 Kiwanis family members are asked to support this initiative by making monetary donations to Aktion Clubs for Sleeping Children Around the World. Click on the graphic to see it in larger size. For more information and for resources, please go to Aktion Club website. 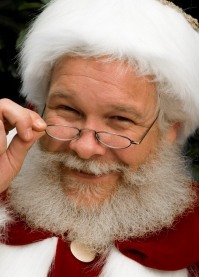 Enjoy the magic of the holiday season at the award-winning Santa Experience, an exciting, interactive visit with Santa at Sherway Gardens weekdays and Saturdays. The Santa Experience consists of a thirty-minute activity period with marching, dancing, singing and story reading with Santa and his elves. Parents are invited to take their own photos at the end of each session when every child gets a special moment with Santa. This program is designed for children aged 2 - 6 years. Holiday Booth near the entrance to Sherway Square. There are no Sunday sessions. please go to the Sherway Gardens website. to promote Sleeping Children Around the World and sell bedkits. Looking after things on Friday morning were (Left to right) Lynda Douglas and Barb Dilworth. The campaign is on until Christmas. Potential donors in Owen Sound can contact the churches for more information or a donation form. surrounded by some of the children he came to help. While those on this side of the world are going about their daily business, Doug MacDougald is miles away helping make thousands of children’s lives better. The local veterinarian is in the middle of a three-week tour in Bangladesh, where he is helping deliver bedkits to 6,000 children through Canadian charity Sleeping Children Around the World (SCAW). The charity sends volunteers in teams of six to countries with low GDPs per capita, such as India, the Phillipines and various nations in Africa and Central America. The volunteers use fundraising money to purchase materials for bedkits – including sleep mats, mosquito nets and bedding, as well as clothing and school supplies – at a cost of $35 per kit, and help assemble and distribute them to children in need. A charity trust fund back home pays for the volunteers’ travel and administrative costs. This is MacDougald’s third SCAW trip – his last was a year ago – and for the first time, he’s going as team leader. SCAW is “a longtime favourite charity” of his parents, he said, with many of their donations over the last 20 years made in his name as well as those of his children and grandchildren. But the missions are often “gut-wrenching,” he says, because in spite of the thousands of kits teams hand out, there are always so many more poverty-stricken families to assist. For his current trip, MacDougald’s team is supported by the Rotary Club of Dhaka, Bangladesh’s capital city. The club also coordinates with other Rotary Clubs there for support, enabling the team to carry out their work in communities across the country. “They’re a tremendously supportive organization,” he said. It’s a similar story back home too. “Several people in our community are supporters of SCAW and actively volunteer and travel,” said MacDougald, adding that local resident Sue Orr will be making a SCAW trip to India next year. Anyone interested in purchasing a bedkit can make their $35 donation through scaw.org, either in their name or that of a loved one (donations make a great Christmas gift, MacDougald says). Donors will receive a photo of the child their bedkit was given to, taken by the volunteers who make SCAW’s work possible. I will have a table at this event selling my art work. 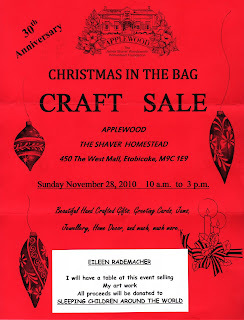 Thank you so much for the great support you gave me on Sunday at the craft show. Because of you all, 10 children will receive bedkits through SCAW. I will send you a photograph of them in about four months after they have been distributed. I hope that you all have a wonderful Christmas. I recently returned from the Chennai distribution of 6,000 bedkits. These are the children who received the bedkits from the proceeds of my art sale. They were very special. Thank you so much for your support. Grant Clark -- One of fifty "Champions of Change"
On November 15th at 8:00 ET on CBC News Network's Connect with Mark Kelley Mark will announce the Top 10 finalists. Then, you get to vote for your two favourites! Grant, a retired principal with the Peel School Board, started volunteering in 1991 with the Sleeping Children Around the World (SCAW), an organization which aims is to provide comfortable bedding and bed nets - or "bed kits" - to children between 6 and 12 years old. He got involved with SCAW after hearing about a fellow teacher's trip to Columbia. He invited the founder of the group to his school to speak about the issue, and found himself transformed to the cause. For the next 10 years he raised money through the students at his school before going on his first mission to Lima, Peru in 2001. He has since been responsible for distributing bedkits to 54,500 children primarily in Africa, including Uganda, Togo, and Zimbabwe. Since then, Grant has presented the story of Sleeping Children Around the World to thousands of school children in Canada to demonstrate the contents and uses of bed kits and speak about the impact of Malaria on Sub-Saharan Africa. His nominator, Albert says: "Grant and his wife use all their own money to cover travel expenses related to their volunteer work," and he adds, "travel to many of these countries is often dangerous." For more information about the Sleeping Children Around the World program, visit their website at www.scaw.org. From Mark Kelly's blog post of November 4th. "The next big day to watch out for is November 15th 2010. That's when you can tune into my show Connect with Mark Kelley at 8 p.m. EDT and watch our Top 10 special. We'll announce the 10 Canadians judges selected for Canada's Champions of Change. Now, voting begins. We need you to get involved." "As of November 15th, you will be able to vote for the two nominees (one international, one domestic) that you feel have made the greatest impact, made the greatest difference, and should wear the crown as a champion of change. These two winners will each receive $25,000, while each remaining eight finalists will receive $10,000. All the money is donated to the nominee's chosen charity. Thank you Manulife!" 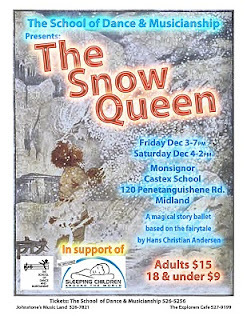 A magical story ballet based on the fairytale by Hans Christian Andersen. Click graphic to see a larger version and for ticket information. Marsha Gormley is opening her archives and offering her original artwork at significant savings to support The Boys and Girls Club, SCAW, and to purchase an entire stable of animals from World Vision. Browse through the catalogues and decide which category sparks your interest most. Purchase a ticket from either the $75 or $150 range. The day of the show the tickets will be drawn randomly and then you can enjoy the excitement as you choose the piece you want. Treat yourself to a piece of “art from the heart” or give a “gift that gives” to someone you love. Click to download $75 catalog. Click to download $150 catalog. 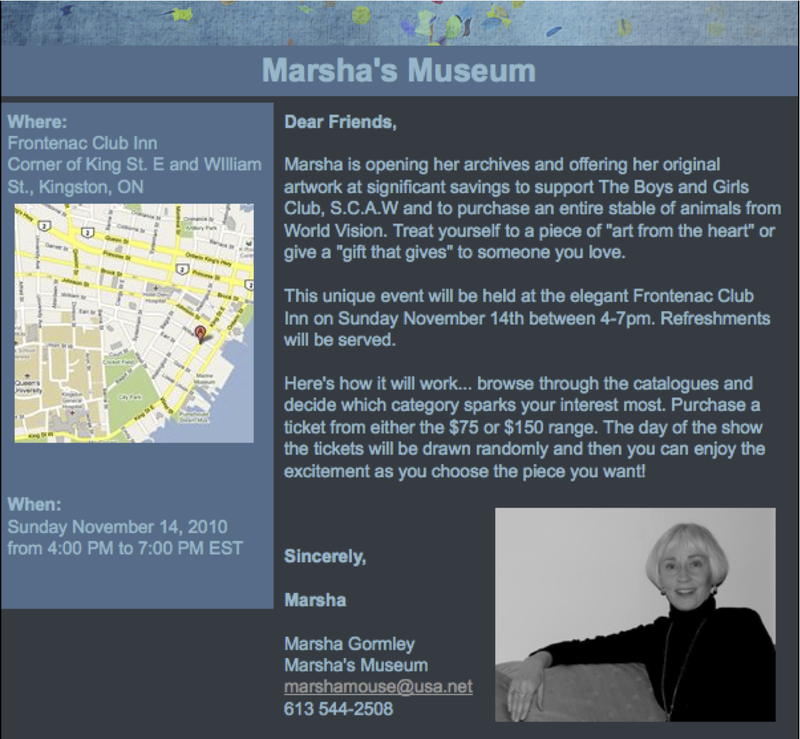 Click on the photo to find out more about Marsha's Museum. Pasta Dinner on October 29. As published in the Bradford West Gwillimbury Times, November 4, 2010. The Churchill and Gilford United Church Sunday School Children first started raising funds for Sleeping Children Around the World (SCAW) in 2000. They brought pennies from home, and collected loose change from the congregation, and made enough money to purchase two bedkits for children in Uganda. SCAW, founded in 1970 by Murray and Margaret Dryden, uses 100% of donated funds to put together bedkits for children in developing and impoverished nations. Each $35 bedkit includes a matt or mattress, pillow, sheet, blanket, mosquito netting (if applicable), outfit of clothes, towel, and school supplies. Since its inception, Sleeping Children Around the World has provided bedkits to children in 33 countries. The Churchill/Gilford Sunday School Children have continued to raise funds for SCAW, purchasing 5 bedkits in 2003, 10 in 2005, 23 in 2007 - and expanding their fundraising efforts. 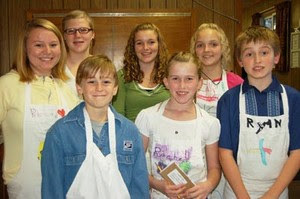 Apple pie sales were introduced in 2007, and in 2008, the kids hosted their first Pasta Supper, raising enough to send 30 bedkits to India. Last year - during the peak of the Recession - they could buy 25 kits. This year, with the help of John's No Frills in Alcona, which donated the pasta, and the Alcona Sobeys, which donated buns, they hosted their Pasta Dinner at Gilford United Church on Oct. 29, hoping to raise enough for 40 kits, to mark the 10th Anniversary of kids helping kids. There were several mentions of our charity on the Internet this past week. Sunday School will host a pasta supper from 5 to 7:30 p.m., with proceeds benefitting Sleeping Children Around the World. The dinner will include homemade sauces, bread, coffee, tea and dessert. Sleeping Children provides kits containing a mat, pillow, sheet, blanket, mosquito net, clothes, towel and school supplies to children in developing countries. For more information on the program, visit www.scaw.org. The celebration was held Sept. 25 and 88 past and current members were there. Guest speaker Dave Dryden with Sleeping Children Around the World spoke about the program and thanked the club for its contributions over the years. The Rotary Club of Peterborough made a donation to the charity Sleeping Children Around the World in honour of Larry Gillman's speech, said Rotarian Doug Armstrong. The charity provides bedkits - including a mat, pillow, blankets, mosquito net, sheet, towel and school supplies - to children in underdeveloped and developing countries. Jean Vanier Catholic High School raises money for disasters, organizations, and tragedies around the world. All of these fund-raising activities are organized and put on by a committee of around 20 students. The committee's unofficial motto is "Focus on being the change."